I have finished the top piece of the quilt. I know need to layer the backing, the quilting and then the top of the quilt. So I will layer all of these pieces and safety pin the layers. Now the question. Do I go ahead and do the binding to help hold it all in place for me to start top stitching or do run a small seam around the edges to hold it or do I hope the safety pins will hold? Help I'm stuck on this next step. Thanks for the help I do not know what I'd do without all of you. The pins will do nicely. make sure the backing is a few inches bigger than the top and start in the center. Okay Thanks! When I started to layer it last night I Panicked. Any tips for layering? I thought about rolling each layer and then unroll and pin row by row. Any other ideas? I use the big binder clips and clip down the backing - wrong side up and getting out all the wrinkles. Then lay the batting and clip that down; then the top - right side up and clip again. I center the whole thing on my table so I have the center of the top as centered as possible. I pin baste (unless a king then I usually thread baste to cut down on weight) in a grid pattern usually about a hand-width apart in each direction. When I have the entire section pinned, I shift everything smoothing and clipping as I go along to get the sides/ends exposed to the top and continue the pinning process. It holds together just fine for hand quilting. And I quilt in a hoop in my lap - not a frame. Good luck, take your time and enjoy the process! I kind of do it a lazy way by tacking it to a wall in my hallway here is one I was basting. I'm not a hand quilter, but I know this one - binding goes on after you have finished the quilting. I don't use pins when hand quilting because the thread always gets tangled up in them. I thread baste. i thread baste, too - nothing shifts. I quilt starting in the middle and work my way out, then bind after I've finished quilting. Cut the binding and the backing several inches wider and longer than the top. I use the Susan Schmacher method...I can never spell her name right.....Let me find it..
Last edited by 117becca; 02-21-2012 at 01:49 PM. I start quilting in the middle and work my way out. That way you can smooth outward as you go, and you won't end up with fabric bunched up in the middle. hand quilting is (normally) done with thread basting- a hoop- work from the center out- the binding is the very last step---after the quilting is complete. do not stitch around the outside- you need to be able to smooth-outward as you go so you do not get puckers/bunches before reaching the outer edges. All previous advice very good. In addition, I always baste around the outside edge and them fold the backing over the front and pin it with safety pins. It keeps the edges from fraying and prevents little bits of batting from being pulled out when you are moving the piece around a lot. So happy you are trying hand-quilting, am afraid it will be a lost art. Thanks to all of you for the wonderful advise. Since I am new to quilting I can not express how pleased I am that I found this board. I have learned a great deal from all of you. It is so nice to know that I have some place to go to ask all of my silly questions where I can get answers. Thank you to all of you for taking the time to respond. And Happy quilting. I handquilt too. I don't use a frame or a hoop. I thread baste the entire quilt using the above mentioned Sharon Shaumber method. I start in the center and work my way out to the edges in sections. I just lay the quilt on my lap and sew. I've never had a problem with puckers on the back even though I don't use a frame or hoop because I can feel the fabric underneath and smooth it as I go. Then I machine sew the binding on the front, turn it to the back, and hand stitch it down. No question asked is a dumb question. This board is great for not being judgemental of anyone on here no matter what their skill and are eager to help. I use the same process and it works great! 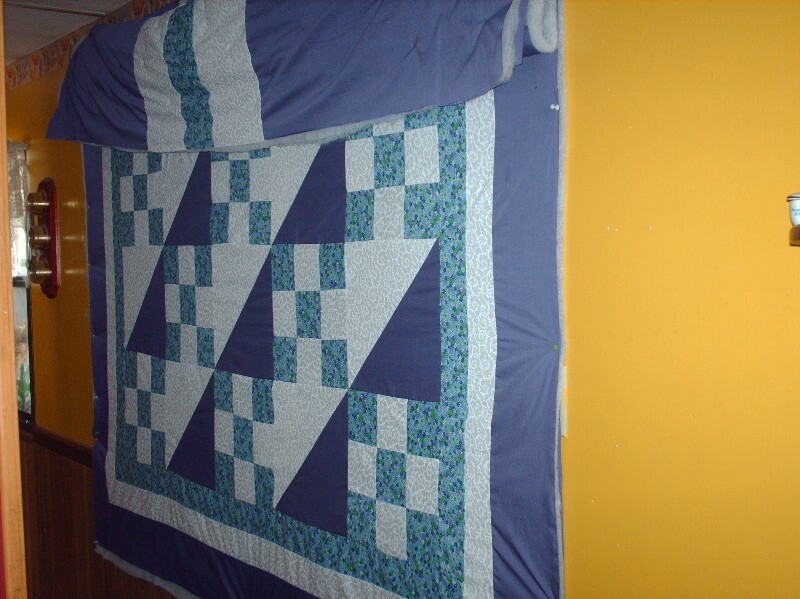 I know one person who binds before she quilts, I think it would be very difficult to do it that way and get your quilt to look nice. Just my opinion. I think I'm the only one that prefers the pillow or envelope finish on a quilt rather than the binding. Admittedly it does leave me with a few puckers but that binding really gives me kittens.